Fashionistas and lovers of classic style will be in their element this January as the cinema spotlight shines on old Hollywood glamour. From La La Land – a visual feast of vibrant colour, romance and ultra shiny locks (and 14 Oscar nominations) – to style icon Jackie O and a bygone era of demure Chanel suits, pillar-box hats and stunning structured hair, they are a journey into bygone eras. 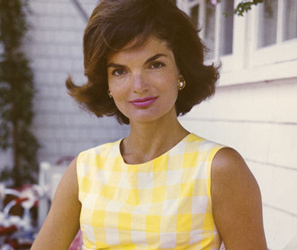 Jackie Kennedy Onassis’ legendary black bob is as infamous as her husband and her beautiful designer wardrobe. The bouffant 60’s style was admired and replicated by women around the world. Will it make a comeback in 2017? Actress Emily Stone sports a tousled long bob ( a ‘lob’) in her role as Mia in La La Land. An autumnal shade of glossy red compliments her fair complexion and creates a striking look. Sleek 40s updo’s, tousled waves and gorgeous hair accessories (a key trend for 2017) all feature in this movie and we won’t be surprised if the clothes, and hair, transfer from the big screen to real life in the months ahead. Rumour has it that Emma Stone, whose natural locks are blonde, dyed her hair a vibrant red after a director suggested it would give her an ‘edge’. True or false we’ll never know but if you’re considering a change of style, or colour, our talented team of skilled colourists and stylists are here to listen to your needs, offer advice and ensure you leave the salon confident and happy with your new look. Pop in to any Charlie Miller salon for a free consultation. You’ll find our price list here and if you book between the 1st and 28th of February you’ll receive 40% off colour and enjoy the benefits of shiny, healthy hair with SMARTBOND.